A blown-glass weather swan barometer uses the same principle as the first barometer made by the Italian physicist Evangelista Torricelli in 1643. The original barometer included a fluid-filled glass tube. Falling air pressure causes the fluid to rise. In addition to being a decorative conversation piece, a handmade weather swan assists in predicting the weather. The weather swan barometer works by indicating rising and falling atmospheric pressure. When the weight of the air decreases, the colored water in the weather swan rises up the swan’s neck. Through observation, learn to forecast the weather with your weather swan barometer. Remove the seal at the glass swan's head. Use a narrow stream of water from a pitcher or the tap. 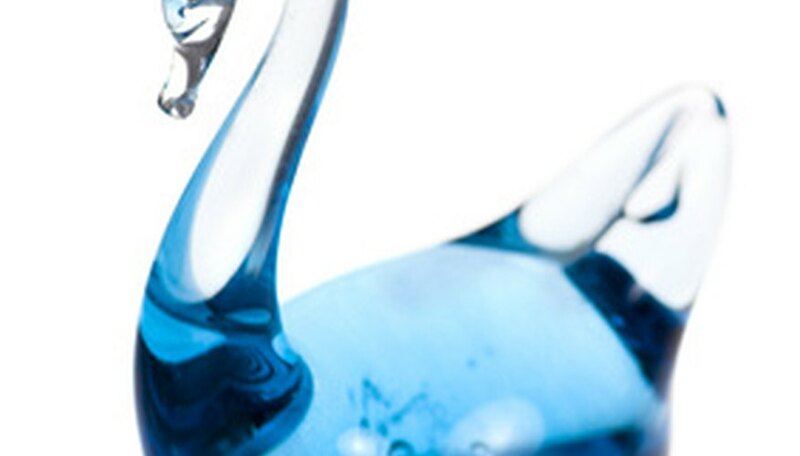 Using distilled or filtered water will reduce the chance of the glass turning cloudy. Fill the weather swan with water, leaving 3/4-inch of air space in the swan’s body. Move the swan's body to shift the air pocket to achieve the correct water level. Observe the water level at the neck. It may be helpful to use a ruler next to the swan for the first few weeks to gauge the water level. Refill the weather swan’s water regularly to keep the level consistent. Accurate readings depend on keeping a constant water level, so it’s necessary to refill water lost to evaporation. Monitor the water level daily. The colored water level lowering in the weather swan over the course of days means low atmospheric pressure. A low-pressure area can attract storms. Rising colored water forecasts fair conditions. For best results, keep the weather swan away from direct sunlight, heating vents and hot areas such as the kitchen. Keeping the weather swan at a steady temperature will reduce evaporation and help to obtain accurate readings. Add a teaspoon of white vinegar to discourage algae growth, if needed. Adams, Gryphon. "How to Read a Weather Swan Barometer." Sciencing, https://sciencing.com/read-weather-swan-barometer-6320226.html. 25 April 2017.